The Pentagon always gets a pass from the corporate press when it comes to reporting on what's causing climate chaos. 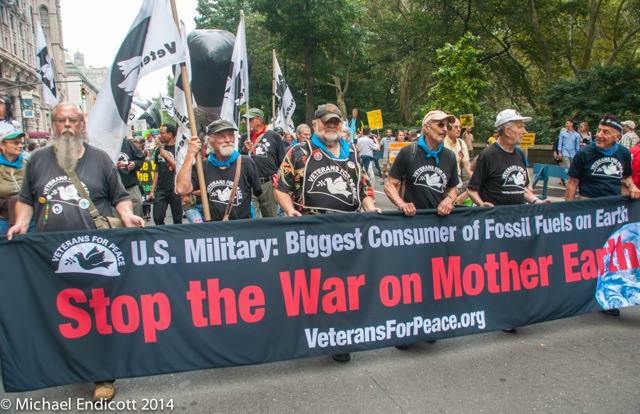 Not from Veterans for Peace, though -- they know a #PentagonClimateCrime when they see one. The Trans Pacific Partnership (TPP) treaty that Congress may vote up or vote down but in no way amend will be game over for the planet if passed. Much of what it would render de jure already exists de facto, but if implemented TPP would trump the sovereignty of nations and lay bare the fangs of corporate government. TPP would render the powers of Congress, the White House and the Supreme Court to regulate environmental protection null and void. TPP would criminalize dissent that can be demonstrated to interfere with a corporation's profits. Think fossil fuel divestment campaigns like the one being waged by students at my alma mater. Chris Hedges reports that Ralph Nader is calling TPP "the most brazen corporate power grab in American history" -- and if you think about some of the brazen corporate power grabs in our short, brutal history that is saying something. If there is no sustained popular uprising to prevent the passage of the TPP in Congress this spring we will be shackled by corporate power. Wages will decline. Working conditions will deteriorate. Unemployment will rise. Our few remaining rights will be revoked. The assault on the ecosystem will be accelerated. Banks and global speculation will be beyond oversight or control. Food safety standards and regulations will be jettisoned. Public services ranging from Medicare and Medicaid to the post office and public education will be abolished or dramatically slashed and taken over by for-profit corporations. Prices for basic commodities, including pharmaceuticals, will skyrocket. Social assistance programs will be drastically scaled back or terminated. And countries that have public health care systems, such as Canada and Australia, that are in the agreement will probably see their public health systems collapse under corporate assault. Corporations will be empowered to hold a wide variety of patents, including over plants and animals, turning basic necessities and the natural world into marketable products. And, just to make sure corporations extract every pound of flesh, any public law interpreted by corporations as impeding projected profit, even a law designed to protect the environment or consumers, will be subject to challenge in an entity called the investor-state dispute settlement (ISDS) section. The ISDS, bolstered and expanded under the TPP, will see corporations paid massive sums in compensation from offending governments for impeding their “right” to further swell their bank accounts. Corporate profit effectively will replace the common good. Activists are converging on Washington DC this week to mount the popular uprising againt the TPP right in corporate lobbyists' faces. You can read details for DC or find actions near you here. Organizers are just as concerned about the two follow on treaties being negotiated in secret. The TPP, TTIP, & TiSA are much more than trade deals–only 5 of the 29 TPP chapters even deal with trade. They are corporate power grabs that impacts every aspect of our lives. If passed, the TPP, TTIP, & TiSA would take away environmental protections, offshore American jobs & decrease wages, remove food safety laws, curtail internet freedom, inhibit access to lifesaving medicine, spur further financial deregulation and more. Under Obama’s recent Fast Track bill these treaties would even ban climate action and immigration reform. But wait, what was the big news story about environmental protection in the corporate press this week? Right. President Obama vetoed building part of the Keystone XL pipeline. Ironically, the President's lame duck veto was likely in response to pressure mounted by the very activism that would become illegal under the TPP. Which he is a big cheerleader for. What about all the OTHER pipelines?! What about shutting down the Canadian tar sands, PERIOD?! What about all the indigenous people who have died from cancer? What about all the hundreds of thousands, or maybe millions by now, of birds killed by tar sands extractions? The boreal forest? The many, many pipeline leaks? Will the Southern Leg of the #KXL be shut down now? How about some grief and humility along with the "celebration" and the calls for thanking Obama for doing something he should have done long, long ago?